The members of Brazil and Beyond love what they do and always welcome the opportunity to share their music with new listeners in new settings. The band has its own arrangements of many selections for use with a concert band or symphony orchestra. If you would like to discuss availability and rates, you may call Rich K at 586.979.8110 or email him at richk@brazilandbeyond.com. For further information, check out the Brazil and Beyond electronic press kit at ReverbNation. 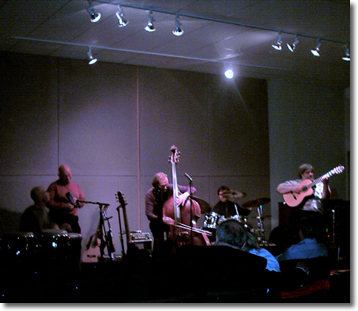 The trio: Dennis Sheridan on percussion and drums; Rich K on bass and cavaquinho; and Garry Weinberg on guitar. 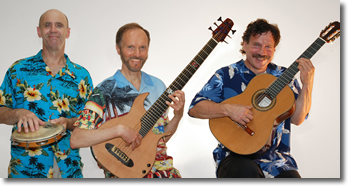 For more intimate settings, Rich and Garry entertain with their duo repertoire. A multi-talented musician, Rich K currently serves as an adjunct faculty member at Oakland University, Macomb Community College and Henry Ford Community College. He is also involved in the private music instruction program of Farmington Hills Public Schools. Formerly he was a bass teacher at Huber and Breese Music Studio (www.huberbreese.com) in Fraser, Michigan. As the founder of The Basschool, he continues to interact with students of all ages on a one-to-one basis.